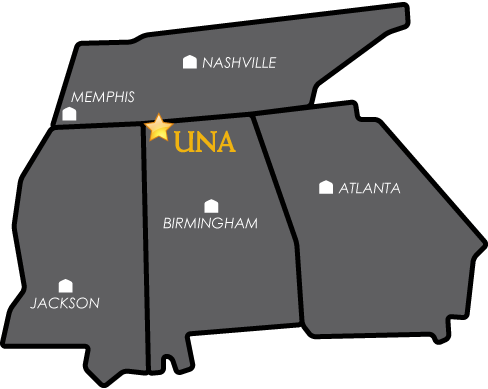 Welcome to the UNA criminal justice program. Our mission is to provide an understanding of the field of criminal justice and security and emergency management and crime scene investigation. While recognizing the interdisciplinary nature of criminal justice, our faculty members have a broad knowledge base and extensive experience in the field, which includes forensics, criminal justice, psychology and sociology, intelligence and security, political science and emergency response and disaster management. We strive to challenge students with critical thinking, reasoning ability, writing and research and practical learning experience. Upon graduation, students may pursue graduate study leading to teaching and research at the university level, law school, or assume employment within law enforcement, corrections, court administration, security and emergency management or other law related and social service areas within the federal, state and local government agencies or the private sector. We offer courses in the traditional classroom format as well as out of class field practicum exercise and internships as well as evening and night classes. There are also Summer sessions to help you reach your goals faster. If you are a non-traditional student or are already in the work force, we offer all of our courses in a convenient on-line format via the Internet to best fit your schedule and learning style.